In addition to blogging, SustainSpace engages in concept and product development. SustainSpace authors Afshin Khan and Mark Ciotola have developed the Oribital Genomics venture converted with astro culture. Recently, the Orbital Genomics concept won ESA Space Explorations Masters prize. Plants provide food, breathable air and psychological benefits. With plans materializing for a Deep Space Gateway, Lunar Village and the Mars community, there may be a lot more people living in the lower Earth orbit and microgravity environments, besides on the International Space Station. However, food production in space is still in its nascent stage. Existing prepackaged astronaut food is not a healthy option for long haul space missions. There is no way to regularly transport fresh fruit and vegetables. It is becoming increasingly evident that we must be able to successfully grow food in space. 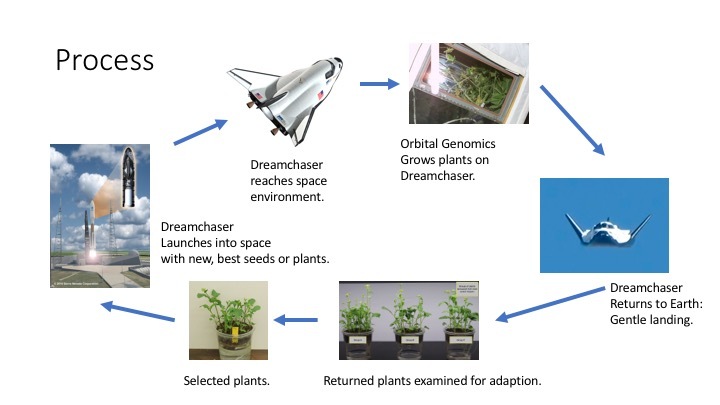 Plant experiments done on ISS have presented various challenges, such as, years of preparation, little iteration and fewer conclusive results. Furthermore, ISS is limited in its genetic analysis capabilities and there are limited astronaut hours for dedicated biological analysis. Hence, for at least the next decade or more, most analysis of plants and seeds grown in space must be accomplished on Earth, which is not feasible. Agile approaches by Orbital Genomics aims to adapt, develop and finally grow crops in space to solve the food production challenge in lower Earth orbit and planetary bodies of interest. Additionally benefit agriculture on Earth. Concept for rapid evolution of plants for adaptability in space environments. We also aim to enter the market as an “astroculture uber-service” for citizen scientists, farmers and agricultural companies, who would be provided with a platform for developing space adapted crops and gaining from space treated crops, to adapt in various challenging conditions on Earth, due to climate change and drought.